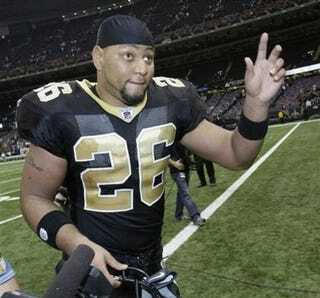 Boy, wasn't it inspirational when New Orleans signed Deuce McAllister before the Cardinals game? The beloved superstar and former face of the franchise, back for one final hurrah. Sorry Deuce, you're cut. Since Robert Meachem's ankle injury leaves his status uncertain for Sunday's game, the Saints actually need that last roster spot for someone who can, you know, play. That means McAllister's out. Again. I guess the NFC Championship game requires less inspiration than a second-round tilt against the D-less Cardinals. If I get another shot (in the future), then so be it. But even befor all this occurred, I was leaning toward retiring anyway," McAllister said. "I was hoping to play again, but I may need another surgery on my knee if I go that direction, and I don't want to do that." Maybe this was all McAllister's big plan to sign a quickie contract to retire as a Saint, à la Jerry Rice, and he just forgot he did that last year. He's not the only one who won't be in the Superdome. Louisiana Governor Bobby Jindal turned down an invitation to the game. Since he hasn't been to a game yet this year, he doesn't want to jinx the Saints. I'm like one of those many, many Saints fans out there. I don't want to change my routine, I'm going to watch them on TV," said Jindal "It's worked all season." Or maybe he doesn't like football because he's not American?! /Jindal's a Repub, so that doesn't work.